Christmas function 2015 – AMS Inc.
40 Years of the Auckland Multicultural Society Inc.
Our end of your function was held in conjunction with Ruritanian International Dance Club. We celebrated a Christmas theme on Saturday 12th December 2015 at the Dutch Club’s Holland House in Penrose from 6 .30 – 10.30 pm. Unfortunately it clashed with a concert at Mt Smart Stadium and therefore our members who came to the function had to park streets away from the venue. However, we did manage to start the evening on time. The Dutch club catered for the function; we had a three course Dutch dinner which was enjoyed by the 70 members and friends who attended the function. The evening started by me welcome everyone. The spokesman of the Dutch club spoke briefly to welcome all, then Julia, the president of the Ruritanian International Dance Club, gave a brief welcome also to all our members. As the food was being served, Derek Williams led us all to a singing of 2 Christmas carols. During the coffee afterwards, we were divided into teams for a quiz competition which was led by Derek. There were 12 questions. One team got all 12 questions right, so they were presented with a prize. We also had a visit from the Dutch Sinter Klaas with his two aids who were all painted in black as Black Pete and carried a sack with gifts. 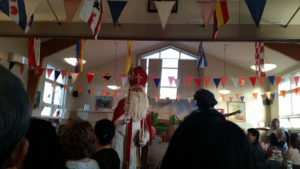 Sinter Klaas then spoke and read out a few people’s names and they good that they had done. He presented each one of them with a gift. All those who came to the Christmas party were asked to bring a $5 gift wrapped present, to be donated to the Salvation Army to distribute these to the needy families on Christmas Day. Ana Maria will deliver them to the Mt Roskill Salvation Army office on Monday 14th December 2015. After dinner we drew the raffle prizes whose tickets were sold during the evening to cover the cost of the hall hire. All prizes were donated by our members. There were about 13 prizes. Derek led us in singing a few more Christmas Carols. Then it was time for us to do some dancing which was led by Jay’s International Dance group, Bronwen, Rae and Ana Maria. Everyone was asked to get up and join in the dancing. Thuten gave thanks to the Dutch Club and then wished everyone a Merry Christmas and Joyous New Year.